On July 20, Maine Department of Transportation traffic engineer Bruce Mattson met with Blue Hill Selectmen, Blue Hill Co-op architect Bruce Stahnke and other interested parties to discuss pedestrian safety at the planned South Street co-op relocation site. 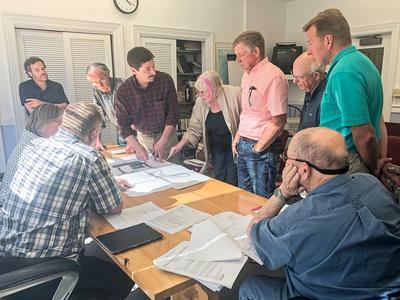 Pictured, Blue Hill Selectmen, seated, and interested parties review the Blue Hill Co-ops relocation plans with MDOT traffic engineer Bruce Mattson, fifth from left. A raised crosswalk linking the Bay School with the planned Blue Hill Co-op relocation site on South Street will be amended as originally proposed by the Co-op. The Co-op’s site plan application had passed all ordinance criteria at a July 9 planning board meeting except traffic (car and pedestrian) safety. Selectmen held that a raised crosswalk would be difficult for the town to keep clear of snow, and could add to, not solve, the pedestrian safety issue of The Bay School and Blue Hill Harbor School students crossing South Street to the new Co-op. “My fear is nothing is in place to slow down traffic,” Selectman Vaughn Leach said when the involved parties met with MDOT traffic engineer Bruce Mattson on Friday, July 20. While the speed limit is slowed to 35 miles per hour prior to the proposed crosswalk location, cars routinely drive faster, all agreed. After lengthy discussion, Leach drew together several safety elements suggested throughout the meeting into a plan that appeared to satisfy all parties. The “tweaked” application will be presented to the board on Monday, August 13, according to Planning Board Chairman Scott Miller. As proposed, raised tables (speed bumps) would be placed on South Street prior to the crosswalk at the north and south approaches, with flashing beacons notifying drivers of an approaching school zone before each raised table. The crosswalk itself would not be raised. The schools would shoulder the cost of the signs and the co-op that of the raised tables. The design would also fit into a proposed South Street pedestrian sidewalk and pathways plan initiated by Blue Hill Community Development, which hopes to secure MDOT funding. “These adjustments (plus signage changes) seem to satisfy the selectmen, MDOT and the schools, and I think it goes a long way to addressing the pedestrian safety provision in our ordinance,” Miller stated after the meeting. The raised crosswalk plan originally came out of a MDOT traffic scoping meeting 18 months ago when the Co-op was developing its relocation plan. That meeting eventually spawned the nonprofit citizen group Blue Hill Community Development and its sidewalk plan for South Street and Tenney Hill.